Unfortunately, many babies are born with ear deformities, and it is very difficult for doctors to predict whether these problems will self-correct. 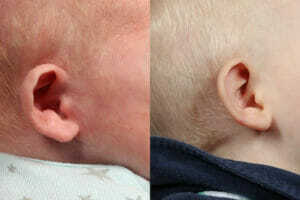 The majority of ear deformities do not improve by themselves over time and in fact, some of them can worsen with age. School-aged children may suffer years of ridicule and abuse from their peers because of ear deformities. The effects of this type of bullying can have devastating and long-lasting psychological consequences. Our pediatric craniofacial surgeon, Dr. Gregory Mackay, offers hope to families whose babies are born with ear deformities. He was the first surgeon in Atlanta to fit pediatric patients with the revolutionary EarWell™ device, which can correct ear deformities in infants without surgery during their first few weeks of life. The EarWell system is extremely well tolerated and has been shown to be 90 percent successful in the correction of infant ear deformities. Dr. Mackay remains one of only a few doctors to specialize in EarWell. The soft silicone EarWell device has a two-piece shell or “cradle system” designed to be worn over the external ear and attached to the skin surrounding the ear. Internal retractors inside the cradle apply gentle pressure over time to carefully reshape the cartilage of the ear. The system is neither invasive nor painful for the infant. Parents do not have to hold the mold in place or worry about positioning it — the cradle holds the ear in the perfect position. EarWell does not interfere with a baby’s ability to hear or a mother’s ability to breastfeed. The adhesive and cradle should be replaced approximately every two weeks. Most babies wear a total of three devices and complete treatment within about four to six weeks. 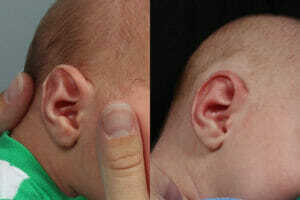 There is a small window of time during which EarWell can be used to correct an infant’s ear deformity. During the first six weeks of a newborn’s life, they have circulating maternal estrogen that increases hyaluronic acid and makes the cartilage of the ear pliable and thus the ear more malleable. But if these six weeks pass and the window of time closes, parents might have to delay treatment until the child’s ears have matured, which is usually between the ages of 5 and 7. By this time, the child may have endured ridicule and teasing at the hands of their peers and suffer from low self-esteem. The surgery to correct ear deformities later in life, which is called otoplasty, is invasive and requires taking time off from school and other activities that the child enjoys. EarWell helps parents and their children avoid the need to invest time, money and energy into otoplasty. Dr. Mackay is a pediatric craniofacial surgeon with over 20 years of experience. He was the first surgeon in Atlanta to place the EarWell device on pediatric patients. Dr. Mackay has experience in both surgical and nonsurgical correction of ear deformities. During your consultation with him, he will be able to determine whether the EarWell device can correct a congenital deformity. Dr. Mackay also has extensive experience with procedures requiring setback or “pinning” of the ear (otoplasty). 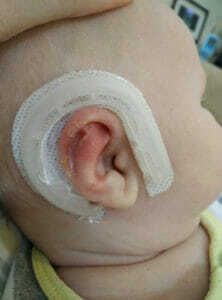 In addition, he has surgical experience with creation of ears in patients with microtia. Dr. Mackay trained in pediatric plastic surgery at the Children’s Hospital of Philadelphia and has 22 years of practice experience in both the academic and private setting. For additional information about the EarWell system, don’t hesitate to reach out to Dr. Mackay. He is happy to answer questions and tell you more about his patients’ results. Please call or email him today.